Enter the colorful world of flowers. 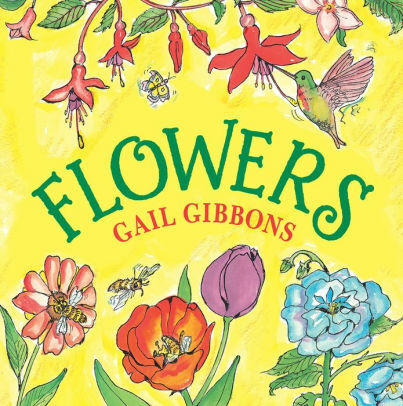 Award-winning author, Gibbons, provides an abundance of introductory information about blooms. She presents the different growing environments, types of flowers, seed travel, and more (including seasonal gardening). Black-lined drawings with watercolor and colored pencil strokes fill every page. A huge variety of flowers labeled with their names are a part of every layout. Cutaway drawings of the flower support the text by naming the parts and illustrating pollination. This book like the others that Gibbons authored will require repeat readings and viewings to enjoy the full scope. Based on the catalog in publication page, a horticulture specialist may have provided some consultation. Readers may wish to pursue or revisit From Seed to Plant or The Vegetables We Eat which are just a few of the numerous books by Gibbons. This title would be a great addition for a plant unit of study and may encourage and inspire young gardeners or future horticulturists.